About three months ago and just a few days after posting my review of OMNI’s Paint by Numbers album, I was contacted by the band and asked whether I could write a review of their upcoming Ghosts album. I tried to be as objective as I could in my presentation and criticism, after having listened the album several times since last Saturday, when I received it. This is my review of the new album and probably the first review of the album in general. In the five years since the release of their first album, OMNI have undergone significant changes as a band. Vocals, once performed by Hans Twite, are now part of Chris and David. Pat Allen, their erstwhile lead guitarist seems to have left the band too, given the band member listing on MySpace (their website was down at the time of writing this review). The feel of the songs has, inevitably, changed too. If one thing remains is the use of heavy-delay and continuous clean guitar riffs as a pad as well as the experimentation with the Warr guitar in many of the tracks and remains a main differentiating factor of the band’s music along with their varied influences. What has changed is the overall feel of the music, partly due to the considerably different vocals, the more mature composition and lyrics. A significant variation between the music in Paint By Numbers and Ghosts is the moderate inclusion of progressive metal æsthetics of the type found in music by Dream Theater or Fates Warning in the 1990s. In particular, ‘End Game’, ‘Demon Haunted World’ and ‘Secret to My Success’ reminded me of a number of late 1990s – early 2000s progressive metal tracks. The vocals in Ghosts are more aggressive and somewhat harsher than those in Paint By Numbers. While good, I found them detached from the feel some of the songs and the æsthetics of the band; for example, while Meridian was perfectly executed and the timbre of the voice matches the feel of the song, this is not the case in ,say, End Game. If anything, I felt that the vocals were a surprise for me and a clear departure from OMNI’s prior work, doing away wit the melancholy of Twite’s voice that shaped much of Omni’s work in the past. The album has some excellent tracks that once again showcase OMNI’s technical prowess and varied influences. Of considerable musical interest to me were Der Bettler, a very short (1:37) melodic and atmospheric track that opens the album and introduces a musical pattern also found in Fingers Crossed, the final track of the album. Other great tracks were the excellent instrumental Out With a Wimper, Meridian, It Came Crashing Down and The Dead Sky. From listening to Ghosts, it is still evident that OMNI manages to combine a number of influences and still remain original in their sound. I found parts of Ghosts very appealing in a way that reminded me of the reasons I originally became interested in the band. I must admit, however, that it was not what I expected as a follow-on to Paint By Numbers, five years since the latter came out. In spite of the clear evolution since 2002 and some solid tracks, I found the album often incoherent in style. 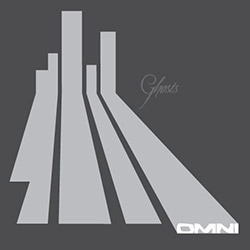 While the potential is evidently still there — and my appreciation of OMNI’s music remains unabated — I feel that OMNI, perhaps in lieu of the change in the line-up, have yet to fully define their music and æsthetics. Ghosts came out on the 25th of April 2008. I would like to thank Chris for sending me Ghosts and asking me to write this review. I’m looking forward to more stuff by the band. I agree with you. I got to know their music by Soliloquy.